Actiosaurus proximal humerus ("femur") in side (1a) and anterior (1) views. Amniote humerus originally referred to Actiosaurus in anterior view (2). Pachystropheus proximal humerus in side (3a) and anterior (3) views. Figures 1 and 2 after Sauvage (1883), figure 3 after Storrs et al. (1996). Comments- Sauvage described this as a probable dinosaur most similar to Palaeosaurus (based on Thecodontosaurus material) within the Megalosauridae (in which he placed all theropods), though differing in the more projecting femoral head, more poorly developed greater trochanter, and marked tuberosity on the proximal humerus. 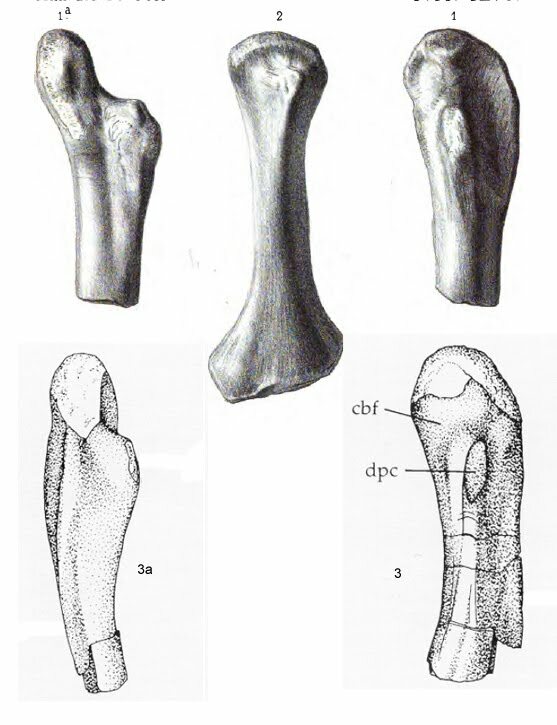 Sauvage based the taxon on two supposed proximal femora of different sizes, a humerus "found with them" and a more questionably referred centrum supposedly from the dorsal series. While the femoral morphology suggested something intermediate between crocodiles and lizards, Sauvage believed the vertebral centrum would indicate Actiosaurus was dinosaurian if properly referred (due to the oblique articular surfaces). The species name was misspelled A. gaudrii by Boulenger (1883). Later authors often placed it in whichever theropod family they included Paleosaurus in- Mayer (1886) in Amphisauridae, and Simroth (1907) and Zittel (1890) in Zanclodontidae. Zittel was provisional in his assignment though and stated Actiosaurus was insufficiently characterized. Huene (1902) listed it provisionally under Lycosauria (containing gorgonopsids and theriocephalans), and Werner (1906) listed it under Thecodontia. Sauvage (1903) disagreed with Huene's identification, noting that while resemblences between Actiosaurus and some "anomodonts" such as Deuterosaurus (now recognized as a dinocephalan) existed, the form was more similar to crocodiles. Note Stache's (1889) reference to Actiosaurus tommasinii is a misspelling of the ophidiomorph squamate Acteosaurus. Huene (1908) referred it to Ichthyosaurus, crediting his 1902 paper despite the fact that was not his conclusion then. The various described elements were found by two different collectors, belonged to at least two individuals based on the two sizes of "femur" and have no record of association, so could easily belong to different taxa. The bone described as the smaller proximal femur is here taken to be the type as it is illustrated, described in most detail and first, and it is the supposed femora that are said to indicate "the presence of a reptile close to Palaeosaurus." Why Actiosaurus has been referred to Ichthyosauria is not at all apparent. The limb elements are more elongate than any ichthyosaur bone, while ichthyosaur vertebrae are famously amphicoelous unlike the weakly biconvex centrum referred to Actiosaurus. The limb elements are also more elongate with better developed articular surfaces than sauropterygians. Compared to contemporaneous dinosaurs, the humerus has a much smaller and proximally located deltopectoral crest and more greatly expanded distal end, while the supposed femur would differ in having a basically proximally projecting elongated and flattened head. However, the "femur" is extremely similar to the humerus of the choristodere Pachystropheus, which is common in Rhaetian beds of England. Points of similarity include the head structure just noted, as well as the deltopectoral crest (greater trochanter of Sauvage) which is an oval knob placed in the center of the anterior face, at the same distance from the head. It is also within the size range of Pachystropheus specimens (greatest transverse width 25 mm compared to 13-35 mm). Interestingly, Actiosaurus has priority over Pachystropheus (named by Huene in 1935). However, Pachystropheus' proximal humeri exhibit so much individual variation and are not distinct from other choristoderes (e.g. Irenosaurus). Thus Actiosaurus is best left as Choristodera indet.. Whether the additional proximal "femur" is also a choristodere humerus is unknown, as it is not illustrated and only stated to be larger (though with oddly different bredth vs. depth proportions given). The element described as a humerus seems to be correctly identified, but it differs from Pachystropheus in being more abruptly expanded proximally and straighter, with a more proximally placed deltopectoral crest. Its affinities require a broader look at amniote humeri. The centrum is not from a choristodere, as it is weakly biconvex to amphiplatyan, taller than long, has oblique articular faces and a longitudinal ventral groove (as in Pachystropheus caudals, but those further differ in being fused to their neural arches at a much smaller size than the Actiosaurus centrum). Among dinosaurs, only caudal vertebrae usually have ventral grooves (common in theropods at least), though only cervicals usually have oblique faces. Plateosaurus ingens does have oblique faces on its caudal centra though, making it a potential candicate for the Actiosaurus centrum. Yet with such a brief description and no illustration, further comparison to other amniotes is warranted before any judgement is made. References- Boulenger, 1883. Reptilia and Batrachia. in Rye (ed.). The Zoological Record for 1883. Record of Zoological Literature. 20, 24 pp. Sauvage, 1883. Recherches sur les reptiles trouves dans l'etage Rhetien des environs d'Autun. Annales des Sciences Geologiques. 14(6, Article 3), 1-44. Mayer, 1886. Herausgegeben von der Zoologischen Station zu Neapel. IV. Abtheilung: Tunicata, Vertebrata. 413 pp. Stache, 1889. Die Liburnische Stufe und deren Grenzhorizonte, eine Studie uber die Schichtenfolgen der cretacisch-eocanen oder protocanen Landbildungs-Periode im Bereich der Küstenländer von Oesterreich-Ungarn mit einer einleitenden Uebersicht der geologischen Verhältnisse dieses Gebietes. Abhandlungen der geologischen Bundesanstalt. 13, 170 pp. Zittel, 1890. Handbuch der Palaeontologie. Volume III. Vertebrata (Pisces, Amphibia, Reptilia, Aves). Huene, 1902. Übersicht über die Reptilien der Trias [Review of the Reptilia of the Triassic]. Geologische und Paläontologische Abhandlungen (Neue Serie). Gustav Fischer Verlag, Jena. 6, 1-84. Sauvage, 1903. Note sur les reptiles de letage Rhetien des environs d'Autun. Bulletin Societe d'Histoire Naturelle d'Autun (France). 16, 309-318. Werner, 1906. Reptilia und Amphibia fur 1903. Archiv fur Naturgeschichte. 1-70. Simroth, 1907. Die Pendulationstheorie. Leipzig Konrad Grethlein's Verlag. 564 pp. Huene, 1908. Die Dinosaurier der europäischen Triasformation mit Berücksichtiging der aussereuropäischen Vorkommnisse [The dinosaurs of the European Triassic Formation, with consideration of non-European occurrences]. Geologische und Paläontologische Abhandlungen Supplement-Band. 1, 419 pp. It's amazing how obscure some of these taxa become over time. Thanks for clarifying.